The club has extensive facilities for both members and their guests to use on a daily basis. 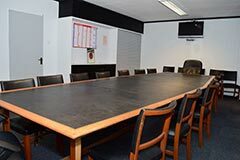 We also have various meeting and function rooms which we can offer for use or hire, whether that be by individuals or organisations. Hopefully the brief highlights below will show you what’s available for our current and prospective members. We also hire rooms to any third party who needs excellent facilities for their special occasion, function or meeting. We’re very much here to help and support your needs and requirements whatever they are, so please give us a call, or pop in and see us in person... We’re sure you’ll get a warm welcome, and you may even be surprised by what we can offer. 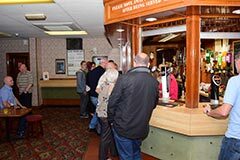 Our members bar provides excellent facilities to relax with a drink from an extensive range of beers, wines and spirts on offer. Enjoy a chat and join in the general banter with fellow members on a daily basis and if it’s TV sport you want then this is the place. The bar area is adults only. The raised seating area is ideal for watching the clubs' teams play their matches, or for just personally sitting out between your games and enjoying a drink. The room is exclusively for the use of adult members and their guests only. The Members Lounge again provides a super environment to sit back, relax and unwind with fellow members or your personal guests. The room sits circa 60-80 people and is adjacent to the main bar area so you can enjoy your drink and conversation in a more formal and quieter environment. The room is primarily used by members on weekend evenings and is exclusively adults only. The room is available for small private functions such as organisational meetings, christenings, birthday parties or funeral receptions etc. We do have catering facilities available for any occasion so if you’re looking for an ideal room for that small gathering this will meet your needs. If you’re looking for a small corporate or organisational meeting room to hold a formal gathering, then we can offer an independent room. The room can support meetings for up to 20 people and we can provide TV and projector and normal meeting stationary facilities as requested. Our FREE evening weekend entertainment is staged in this room and you’re more than welcome to pop in and enjoy the music and entertainment on offer. 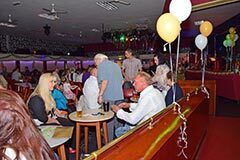 The large tiered seated area provides an excellent view of the superbly lit stage area and dance floor and together with the large bar facilities you’re sure to enjoy your night. The room is also ideal for larger midweek day or night gatherings such as funeral receptions, personal parties, corporate functions or general concerts. We do have catering facilities available for any occasion so if you’re looking to support your event we’re more than happy to help. Our primary entertainment facility which supports large functions and concerts for circa 300 people. The room is one of the very best in the Midlands and has staged many successful events over the years and you really do have to see it to appreciate the facility. We have two large bar areas, raised sitting area, large stage and dance floor and a truly magnificent concert lighting facility to enhance that special occasion. 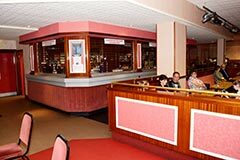 The Function Room is available for that large private functions such as wedding receptions, birthday parties, ( with the exception of 18th or 21st birthdays) corporate functions or general concerts. We do have catering facilities available for any occasion so if you’re looking for something different to showcase your event then this is ideal. The club does reserve the right if it’s considered appropriate to ask for additional security at your cost for any event booked. Accessibility Statement - The room is on the first floor and is accessed via stairs, so therefore may not be suitable for elderly or disabled people.